Tom Waghorn, Orchestra Assistant, ensuring that the pit is in order pre-show. As we settle into our second week of Tour 2015, the routine of making ourselves at home in a new venue is becoming second nature. Milton Keynes is one of the more modern towns we visit on Tour. The theatre was designed by the same architect who designed the theatres in Plymouth and Woking, where we visit on 24 November and 1 December, so the layout backstage feels like home. Our Orchestra Assistant, Tom Waghorn, and our Orchestra Manager, Jonathan Tunnell, have the task of managing the fitting of the Glyndebourne Tour Orchestra into the orchestra pit at each venue. Each venue’s pit has a different size, layout and depth. The Milton Keynes orchestra pit is wonderfully spacious, meaning there’s a lot more flexibility when setting up. Before the first performance in every venue we arrange a balance call, which allows the conductor to run through particular parts of the score with the full orchestra, principal singers and chorus. In this way the performing company becomes familiar with the acoustics of the auditorium, and the orchestra adjusts to the new pit formation. The deep pit at Milton Keynes is incredibly useful for space, but it also means the orchestra needs to get used to being at a different level and establish a new type of contact with the conductor. A perfect view of the stage: The Supertitles Box, Milton Keynes. Another aspect of the Tour that needs to be checked thoroughly in every venue is the supertitle screen, which is transported to each theatre we visit. 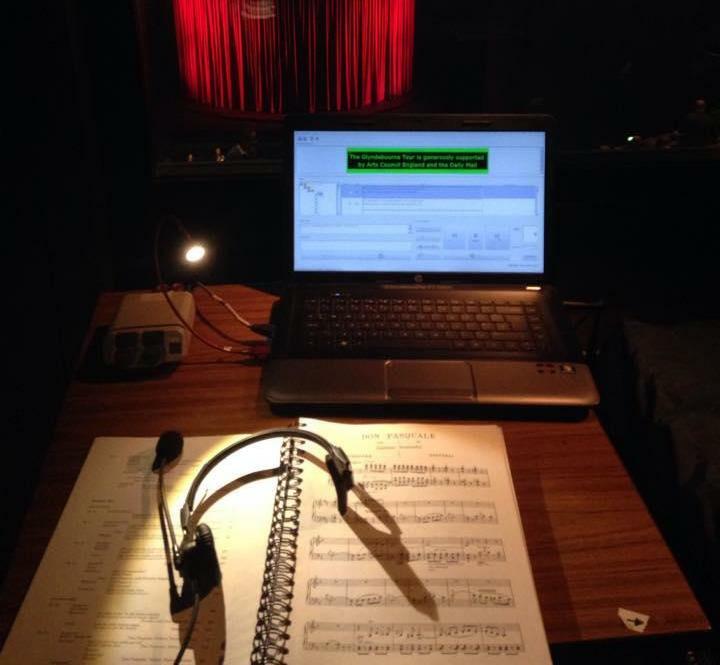 The supertitles sit directly above the stage and are controlled by a member of the Music Library, who follows a carefully marked musical score that indicates when titles need to be moved on in relation to the drama on stage. With Die Entfuhrung aus dem Serail containing so much spoken dialogue, supertitles are integral for audiences and their understanding of the narrative. As well as operating the supertitles, the Music Library is responsible for the preparation of musical material for each production. On 15 November we’ll be arriving in Norwich for the next leg of Tour 2015, where I’ll be writing my next blogpost.